A serviceable World War Two submarine action drama and romance with a propaganda bent, Crash Dive spends equal time on land at the sea, but is better wet than dry. Lieutenant Ward Stewart (Tyrone Power) is a veteran of the Navy, most recently enjoying the nimble speed of Patrol Torpedo (PT) boats. Reporting to the navy base in New London, Connecticut, Stewart reluctantly agrees to join the crew of the submarine USS Corsair as Executive Officer, under the command of Lieutenant Commander Dewey Connors (Dana Andrews). 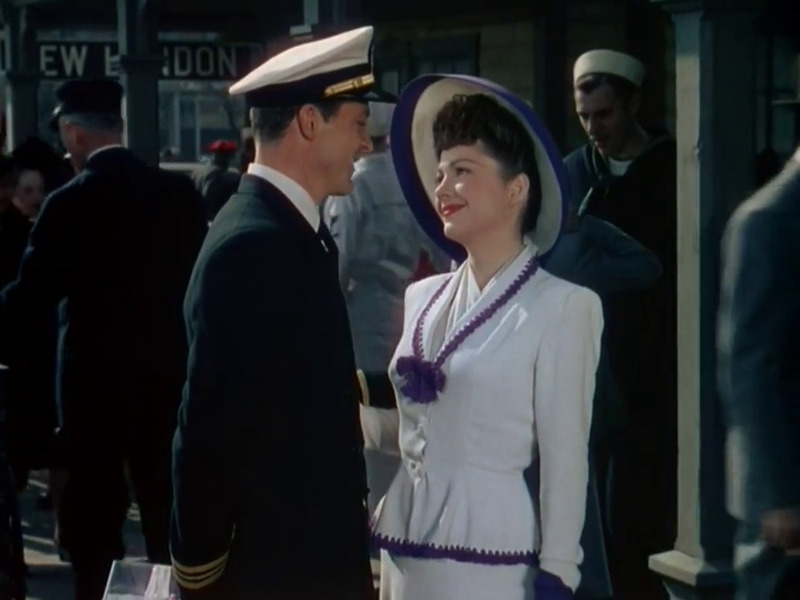 Before the Corsair sets sail, Stewart meets schoolteacher Jean Hewlett (Anne Baxter) and is immediately smitten. He pursues her with great determination, and although she initially fends him off, eventually they fall in love. Stewart does not know that Jean is Connors' fiancée, a man she admires but does not quite love. Meanwhile, out in the North Atlantic sea, the Corsair tangles with a German mine boat, and discovers evidence of a secret enemy base. Stewart and Connors make an effective commanding team, with Stewart more of a risk taker and Connors more strategic in his approach. With the romantic triangle reaching a climax, the Corsair is sent on a dangerous mission to uncover and destroy the hidden German naval station. For a war film designed to boost recruitment in the US Navy, Crash Dive spends a lot of time on the shore, delving into the romance between Ward and Jean. Tyrone Power and Anne Baxter make for an attractive couple and the Technicolor production captures them both at their most resplendent. But Stewart's relentless pursuit and Jean's coy hard-to-get act consume plenty of screen time, and it's often difficult to remember that there is a war going on. In the scenes back on the sub, director Archie Mayo switches gears and mounts a credible thriller. Although many of the submarine tactics and actions portrayed are pure Hollywood, Mayo does manage to portray the camaraderie and tension inherent in life underwater, from the hours of abject boredom to suddenly engaging in deadly hide and seek with the enemy. There are plenty of scenes with the requisite depth charges, subterfuge, silent pursuit, and torpedo attacks on enemy vessels. Upon returning from one mission, Stewart and Connors demand a massive meal made exclusively of fresh fruits, vegetables and milk, in a rare acknowledgement of the deficient nutrition served up on a sub. The character dynamics are above average, with Stewart and Connors melding their leadership styles to good effect and with just a trace of competitive juice. The script by W.R. Burnett and Jo Swerling also deserves a lot of credit for featuring the black crew member Oliver Cromwell Jones (Ben Carter) in a prominent and sympathetic role. Oliver befriends fellow submariner Mike "Mac" McDonnell (James Gleason), who is suffering from a heart condition, and their relationship evolves throughout the film and culminates in the final battle. And that final climax is not half bad. Despite all sorts of questionable tactics and unrealistic dullness from the Germans, Mayo delivers a solid 20 minutes of commando-style Grade B action to enliven events and stir the blood. Crash Dive will never be mistaken for a classic war film or an emotion-packed romance. It's an honest war time romp promoting the war effort on a limited budget and in a decent package. Already enlisted in the Marine Corps, star Tyrone Power headed off to recruit training for the real war soon after filming wrapped, a rare case of an actor staying true to the message of his own film.